A recent study by Aptaris and Dunnhumby on 2017 Advertising & Promotional Practices among U.S. grocery retailers reveals that 95.6 percent of food retailers have a presence on social media related outreach. A further breakdown of these statistics gleaned by the Progressive Grocer show that all 96.4% of food retailers using social media have an active Facebook page and more than half of the active social media food retailers are active on Twitter. Other second- and third-tier platforms such as Instagram, Pinterest, and YouTube are also growing in popularity among grocers. We have tracked down the best and Whole Foods Market leads the pack. The below grocers are succeeding on social media mainly by seeking to serve customers even before they perceive the need to be served. 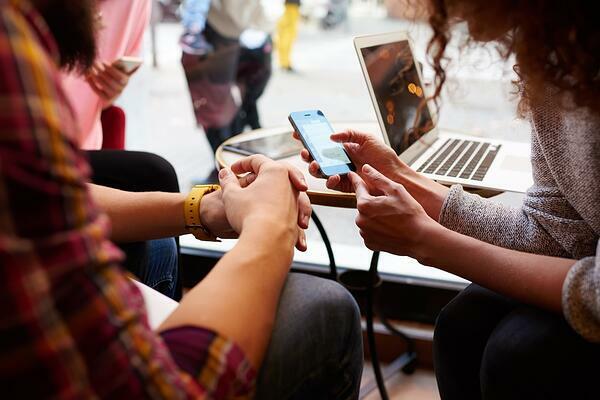 They are using their social media channels to create need for their products, increase brand awareness, and spark conversations between and among their shoppers. Recipes dominate the social space, yet peppering news feeds more and more are discounts and special promotions like Wegman’s #TreatYourEats for a Superbowl campaign to win $250 and Kroger’s Free Friday Download, an ongoing digital coupon or discounted product campaign. 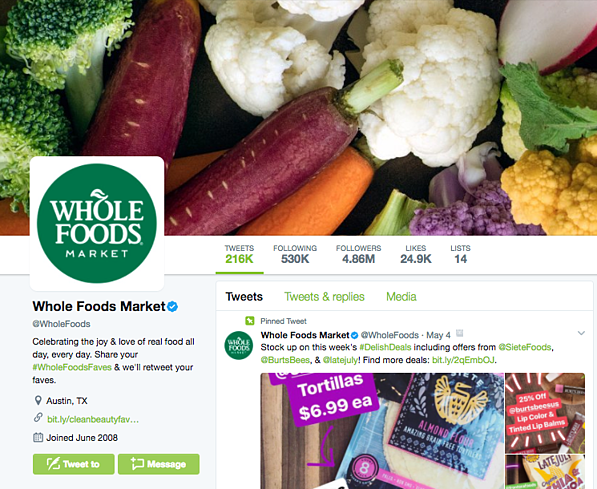 We suggest taking note and following these 6 top grocers on social media. Aldi USA, another grocer with great and growing social media presence, currently has nearly 90K followers on Twitter (@AldiUSA). Since June 2012, Aldi USA has posted 14.8K tweets and seems to be highly responsive to customer service inquiries. It is worth noting that @AldiUK, on Twitter since 2009, has gathered 305K followers and posted 84.9K tweets. 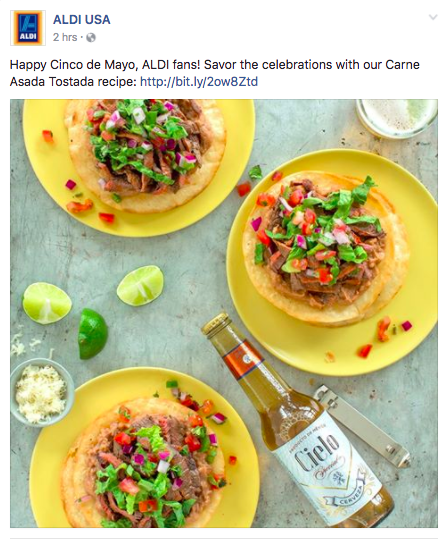 On Facebook, too, Aldi USA currently has more than 2 million followers of daily recipe, video, and product promo posts. Wegman’s has active Twitter, Facebook, Pinterest, and YouTube accounts. On Twitter, @wegmans has 182K followers and has posted 61.5K tweets since August of 2009. Wegman’s Facebook page boasts 354K followers, with daily posts that are primarily recipes, but also some brand-related news and information. 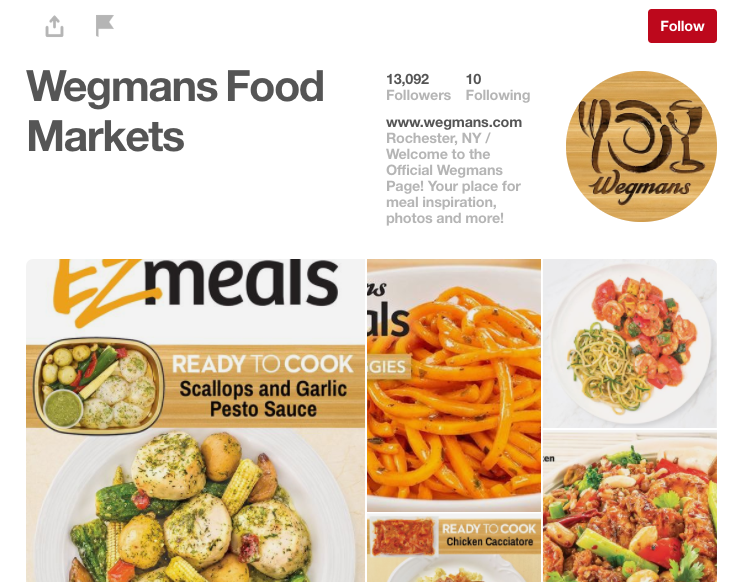 Wegman’s also uses Pinterest (13K followers) and YouTube (9,500 subscribers). Kroger’s Twitter account (@kroger) has 130K followers with daily posts of recipes, employee recognition, fan appreciation, and typical marketing posts including product information and promotions. On Facebook as well, @Kroger has 1.3 million followers, with daily posts of recipes and a fan-favorite “Free Friday Download,” a digital coupon posted on Fridays that you can redeem at a Kroger’s store for a free or discounted product. Kroger on Pinterest (@krogerco) has about 13K followers, a frequent posting schedule (sometimes more than once daily), and many boards — Kid-Friendly Kitchen, Easy Entertaining Ideas, Standout Sides, and Brunch Recipes, to name a few. Kroger’s YouTube channel has about 2,000 subscribers. Publix is another highly active grocer on social media. On Twitter (@Publix), more than 253K people follow the company. 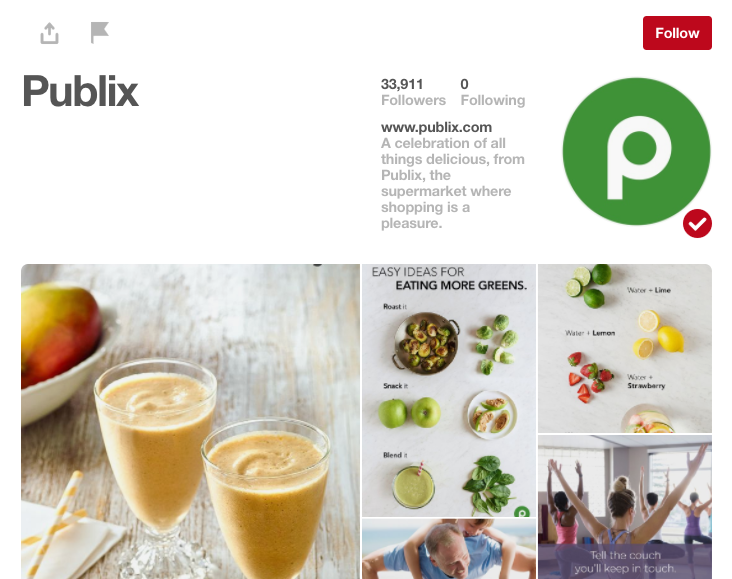 On Facebook, 2.6 million follow Publix’s daily posts of pics, videos, contests, news, tips, and, of course, recipes. The grocer’s YouTube channel is stellar, boasting 12K subscribers, and while their Pinterest page has 33.8K followers, there is not many pins to see there. 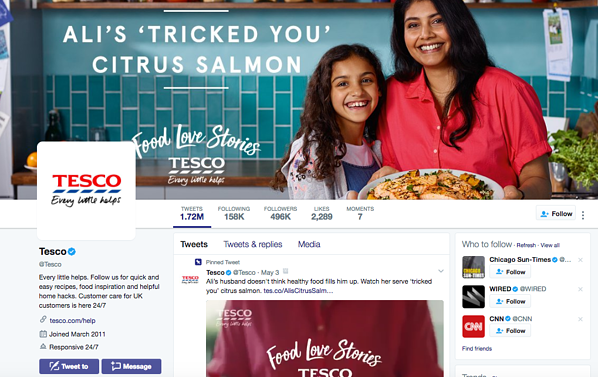 Tesco, a UK-based grocer, is also touted for a strong social media presence. Its main Twitter account (@Tesco) has 496K followers, and compared to the other grocers’ social media platforms, Tesco seems to follow back more than others. The latest count (May 4, 2017) of how many Tesco is following was 157.7K, and with 1.72 million tweets, it’s no wonder so many people are engaged with the company on Twitter. These stats are only for Tesco’s main account! Among Tesco’s other 14 Twitter accounts, such as their customer care and their offers accounts are also extremely popular with 49,000 and 48,000 followers respectively, while the other of the ancillary accounts have around 10,000. On Pinterest, Tesco has 46.5K followers and hundreds of pins. Facebook/tesco shows 2 million followers and several posts per day of videos, pics, events, and community connections. 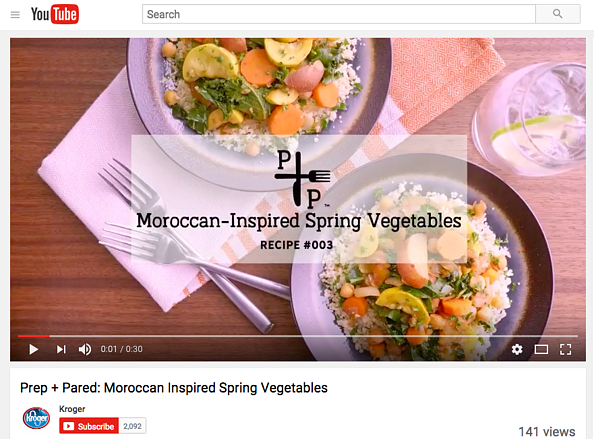 YouTube subscribers count upwards of 73K, and like Whole Foods, Tesco’s YouTube channel includes many categories, such as Baking Recipes and Family Favourites. It is worth noting, there are a few big grocers like Trader Joe’s, which has no official corporate presence on social media, and smaller chains like Food Lion and Harris Teeter, which are not as active on social media as other grocers. Nevertheless, social media is playing a role in the marketing and brand awareness for these grocers as well. Trader Joe’s fans started Facebook and Twitter accounts to the promote TJ products, locations, and customer service stories. @TraderJoesList, a fan-based Twitter account has nearly 65K followers who look for favorite recipes, new products, and more. @HarrisTeeter has 57.4K followers on Twitter, while @FoodLion has a similar following of 56.8K. Food Lion’s Facebook page is gaining popularity, with their current following number at 1.2K.